So I’ve always wanted to see Mayhem live and missed every opportunity that presented itself thus far. Being fully aware of my own failings, I was obviously super excited that the band was playing ‘My Eindhoven’ on 18th May 2014. 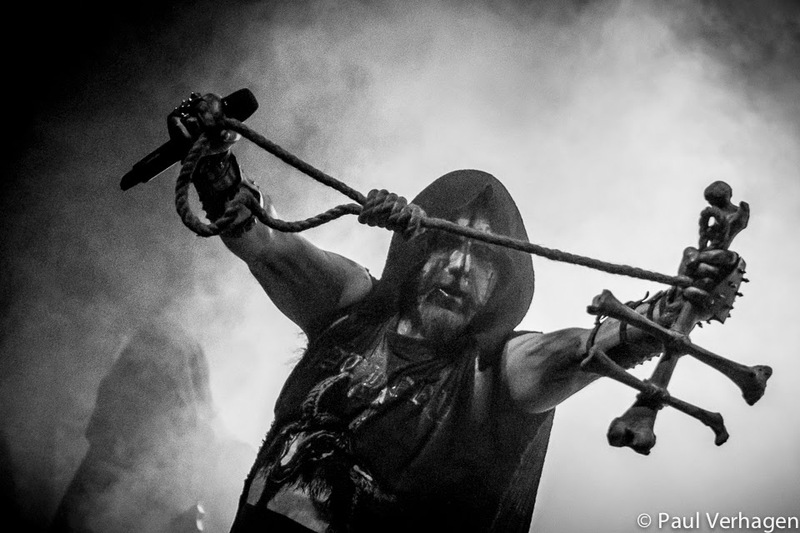 Having dedicated a part of my studies to the birth of Norwegian black metal (Burzum in particular, but small chance to ever see Varg Vikernes playing live), I was prepared and probably equipped with high expectations for their performance, honoring the 30th anniversary of this notorious band. Let’s face it, don’t we all have some sort of awe and grand idea of the band that pretty much made the genre into what it is today (no, I don’t intend to start that discussion). Mayhem first released the ‘Deathcrush’ EP back in 1987, breaking ground for a new form of metal. The 'De Mysteriis Dom Sathanas' album in 1991 cemented that form and the name of the band. We can always dwell on the point whether Mayhem is still the same band that built the kind of reputation shown in various documentaries or not (although those legendary records will always be enough to make the group memorable): 23 years later, what does Mayhem still have to offer on the music front? The signs were there immediately: it was one of those early summer days in Eindhoven and there were about 12 people, clearly all with a sun allergy, who actually decided to be at the venue in time for the opening act, Merrimack. Not good. The band’s name indicates in Celtic the swirling pit at Hell’s deepest end. That was exactly how their music sounded like. 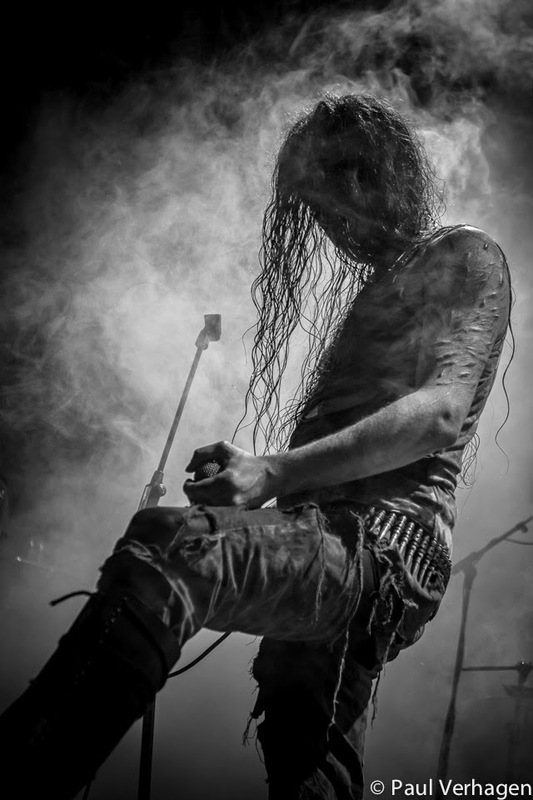 Vocalist Vestal acted as if he was being forced down, dragged into that pit while screaming defiance. The furious sounds were like roaring fire, but in general the act looked rather stiff. The lack of audience made the lack of commitment from the band quite understandable; besides, the large venue made the stage look smaller and there were only a few faces opposite it. The passionate performance of Vestal didn’t make up for the rest of the band, though the music was played well, reminding me of swirling flames and erupting volcanoes. There’s no point in hiding that Nihill was the peak of the evening, both musically as well as aesthetically. 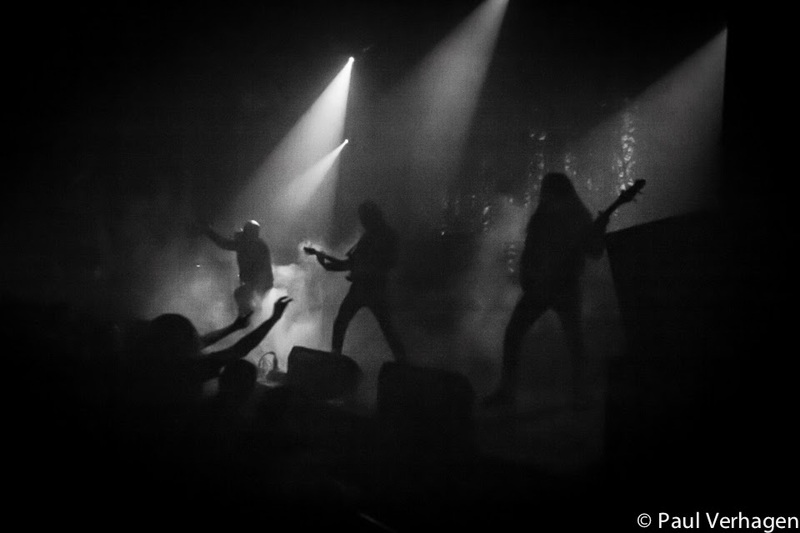 The curtains were drawn while the space in front of the stage filled up with a good crowd out to see the Dutch black metal band. When the curtains finally opened, there was nothing but smoke filling the vision of the onlookers. Dark shadows emerged and the music started to creep into the room. No fiery chaos, but measured coldness. Streaks of ice cut through the silence like the dim shadows on the stage cut through the mist. Nihill is the frozen wastes, despair and carefully measured strength. Their flat soundscapes of nihilistic droning music filled with foreboding gloom were broken by piercing bursts of violent black metal. Never letting go to chaos, always controlled and dosed. The quieter parts were dreamy, filled with promise of unknown lands. The other side of the journey was into the deep cold, which filled the venue and made one shiver with a chill that seemed to have pervaded the place for real. It might be that this live ritual actually changed the audience’s temperature. We had hell’s fire with Merrimack, now the permafrost of Nihill. What did Mayhem have to offer? The answer is slightly disappointing, I’m afraid. The legendary band walked on to Sylvester Anfang, composed by Conrad Schnitzler in the early days of the band. 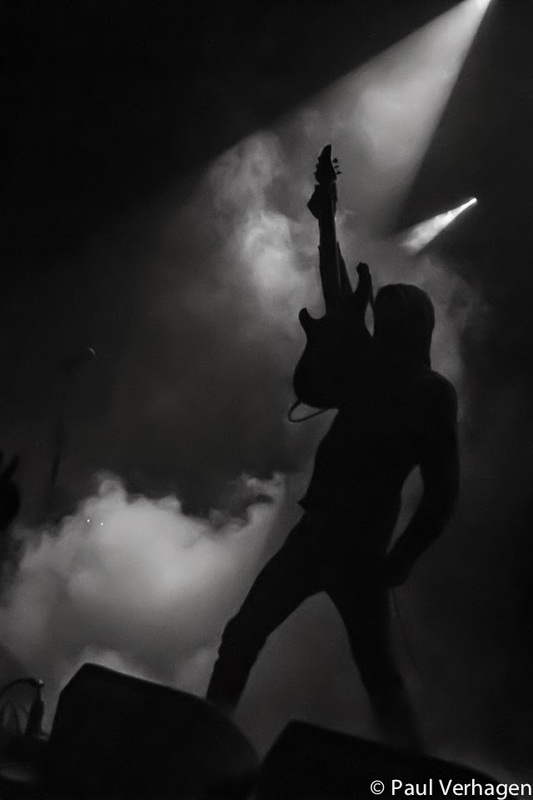 A barrage of guitar sound was laid down to open up the set, which quickly merged into a sludgy stream of sound. For vocalist Attila Csihar it was the moment to step out of the shadows and demonstrate his vocal artwork. 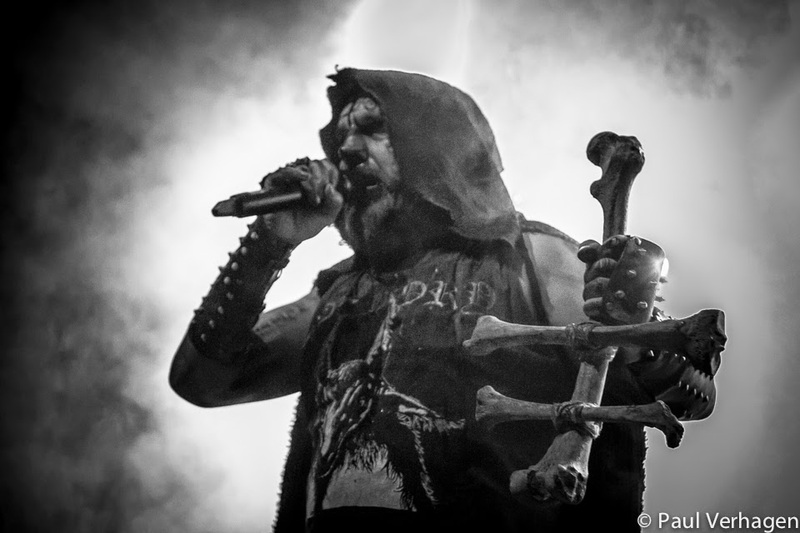 Shrouded in a cape and the only one who donned corpse paint, his ritual began. Gesturing with bones, skulls and a gallows rope, he moved in a trance across the stage. No sheep heads or other dead animals this time around: slightly disappointing. In high speed the band finished up the song list for the night. There weren’t many inspired or memorable moments and the songs merged into a puddle of grey sound matter, not showing much strength or impressive parts. Old hymns like Deathcrush and Pagan Fears were almost impossible to distinguish from the other songs. Though the reviews for the new record (Esoteric Warfare) have been highly praising, the band seemed to have little wish to impress the visitors. Attila’s act was not imposing, though his vocals were as strong as always. Necrobutcher, the only original band member, became a bit riled up towards the end of the set by some fans, but that was all they got. At the end of the performance, the band left instantly, without much regard for the crowd that managed to sit through it all. Perhaps it was the disappointment for the wanting amount of visitors, but it felt that right now this band is thriving on reputation alone: maybe reputation is all the band has got going for them. Mayhem: thriving on reputation, but little inspiration. Nihill: the convincing peak of the evening. 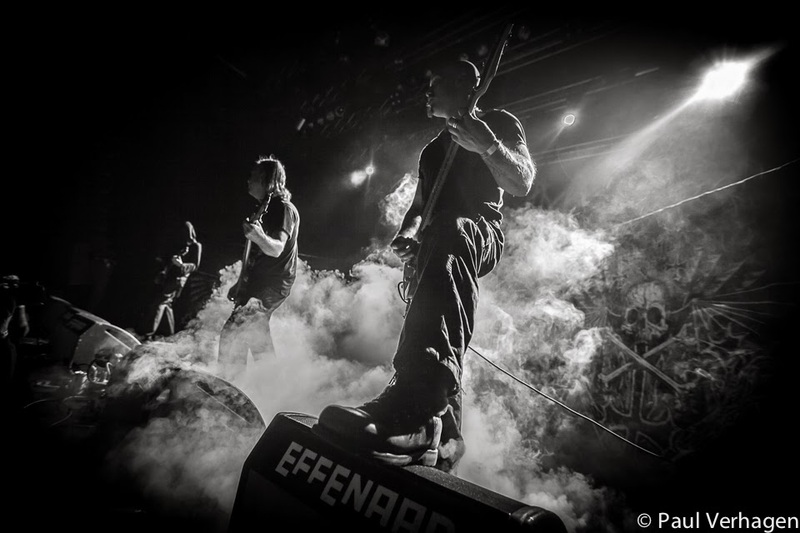 A warm thank you goes to Paul Verhagen of Achrome Moments for the above spectacular shots!